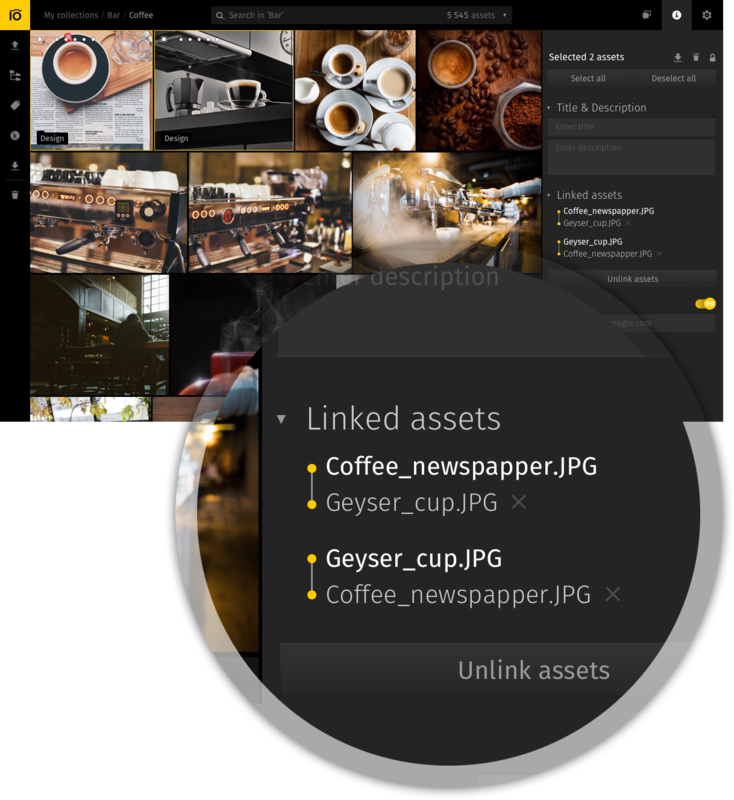 Linked Assets is a simple way to build a connection between related files. This function helps you have related assets together at your fingertips, which means that having found one file, you will automatically get quick access to the other. How can I link related assets? To select individual files that are not in sequence, hold down Cmd (for Mac OS) / Ctrl (for Windows) and select each file you need with the left click of the mouse. To select a sequence of assets, hold down Shift and make a left click on the first file you want to select. Without letting go of the Shift key, select the last file in sequence. After you have selected the necessary assets, find Linked assets section in the Infopanel on the right. Here you will see the list of assets you have selected. Press Link assets button, and the selected files will be linked with each other. Once the files are linked, you’ll see the connections between them. The connected files are shown as bright yellow bullets (or blue bullets if you use a light UI color scheme). You can create as many separate chains of assets linked with one particular file, as you want. How can I unlink one asset from the others? Click X next to the filename of the asset which is open for preview. This will unlink it from the chain of linked assets, but keep all the other assets in this chain linked with each other. In the same way, you can unlink any asset from the chain of linked files by simply clicking X next to its filename. How do I unlink multiple assets from each other? Sometimes you have a number of assets linked together, and you want to unlink them all from each other in one shot. The best way to do so is to select all the linked assets (as described above) and press Unlink assets button.